Hadrians Villa is very interesting and both Villa d'Este and it's garden with all the waterfalls, pools, and fountains was fantastic and very, very beautiful. Our guide was very good and historically accurate. He was pleasant and his English while accented was very good and understandable. The suggestion for lunch had excellent food but was too expensive (and I am from NYC so I rarely have sticker shock). He was very professional. The initial pickup point on Via Cavour is a little obscure and with our non-English speaking taxi driver and his non-Italian speaking riders (us), we were a bit concerned over arriving on time. All worked out though. Our tour guide Larissa was excellent. Her background as an archeologist really added a lot to our time at Hadrian's Villa. The ruins are very extensive, but she gave us the information to properly envision the Villa as it was thousands of years ago. The recommended lunch spot in Villa d'Este was very nice and we really enjoyed the traditional italian food. The gardens and fountains at Villa d'Este were spectacular. The tour and commentary as we explored a good portion was very interesting. We also had a good amount of time for self-exploration. Transportation to and from the city went well. Would highly recommend this tour! Villa d'Este is exceptional. The gardens and fountains beautiful. 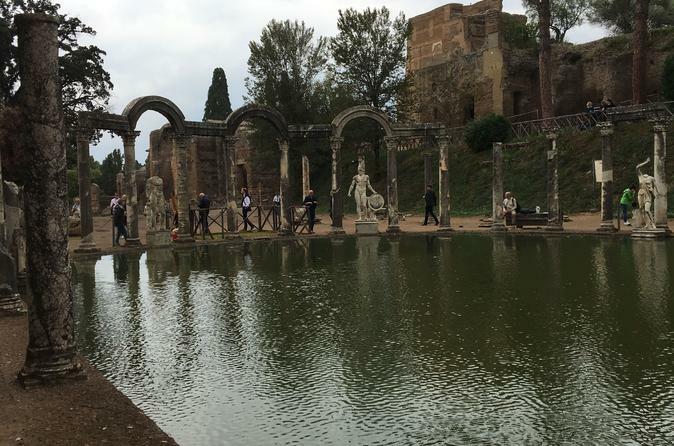 Hadrian's villa was interesting but a wish we could have seen more of it. This tour was originally just a way to fill a spare day around Rome but I felt it was very worthwhile and among the best parts of our trip. The Guide was funny and knowledgeable. We had a perfect day. Our guide Joseph was wonderful. He was very funny and knowledgeable.The whole day was perfect. I highly recommend thus tour. 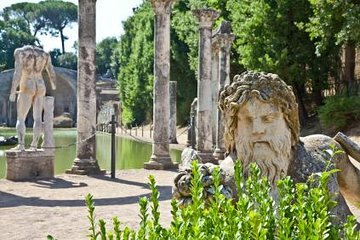 This Tivoli Day Trip to see Hadrian's Villa and Villa d'Este is a must! Joseph Giuseppe was a wonderful guide - he was adept at speaking about the two villas as well as his hometown of Tivoli, providing many anecdotes and stories that kept everyone's attention while providing recommendations for things to see on our own. Each stop was a mix of guided tour and personal time, meaning you got all the history and group questions while also feeling like you could explore. All in all, highly recommended! Giuseppe was our guide and he was perfect! So well informed - a Tivoli native and you could tell how proud he was of his town. The day was hot, but there was plenty of shade and and the pace was just right. Villa d'Este is breathtaking. Our family trip to Tivoli was wonderful. Our tour guide Giuseppe was a Tivoli native and did a great job showing us the cute town he loves. We would have enjoyed the tour more if it was not so ridiculously hot a hundred degrees but what can you do. We enjoyed Hadrian's Villa with all its amazing water fountains and gardens the best but be warned about all the stairs. Our favorite part was eating lunch at the authentic Italia restaurant Giuseppe took us to. It was the best food and service we had in all of Italy! Great tour around Tivoli. Bus ride is about 45 minutes from/to Rome. Our guide was Guiseppe who is local and outstanding. There is a lot of walking specially for a long day but it is well paced. You start at Hadrian's Villa which is amazing. Then you break for lunch and a bit of town walking. Then you close with Villa d'Este which was simply spectacular in terms of beauty, architecture and engineering. Highly recommend this tour for a day outside of Rome.